Visibly soften and smooth the appearance of even the deepest wrinkles with this revolutionary double-action peptide cream that contains two of the most powerful and effective peptides that bio-science has to offer. Peptide Matrixyl synthe'6 tells the skin to synthesize new key components such as collagen and to restructure itself. Peptide Argireline helps relax facial muscles, smooth wrinkles, and discourage the formation of new lines. Enriched with anti-aging antioxidants Pycnogenol, Vitamin C and Green Tea, this rich moisturizing formula helps reduce the look of wrinkles, visibly improve skin's resilience, tone and texture, and prevent future damage. 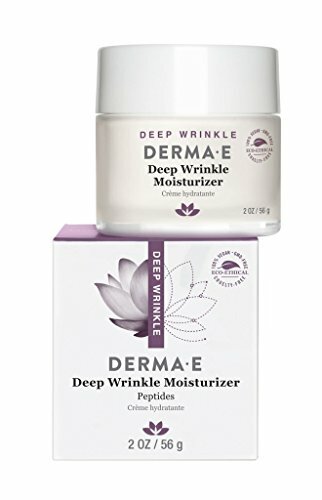 Ideal for those with normal to dry skin who are looking for an intense wrinkle-fighting formula that promotes a smoother, more youthful appearance. 100% vegan, cruelty-free, paraben-free, sulfate-free, mineral oil-free, lanolin-free, gluten free, GMO-free. Please note that DERMA E is in a packaging transition. There is a chance your products will arrive in the older package instead of new, please know that we assure you it is the same great formula with effective results. If you have any questions about this product by DERMA-E, contact us by completing and submitting the form below. If you are looking for a specif part number, please include it with your message.